Although most orthodontic curricula provide courses on interdisciplinary orthodontic-periodontic treatment, there are still surprisingly few resources on the topic. Written by leading scholars in the field, this book provides a broad analysis of the topic from both the periodontal and orthodontic perspectives. The authors systematically analyze the scientific and clinical interactions of these specialties by reviewing all the available evidence and using case studies to demonstrate the principles discussed in theory. 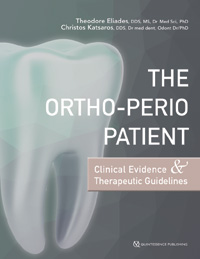 The result is a text that outlines the treatment fundamentals and shows how to improve the therapeutic outcomes involving orthodontic-periodontic interventions. Kokich, Vincent G. / Mathews, David P.